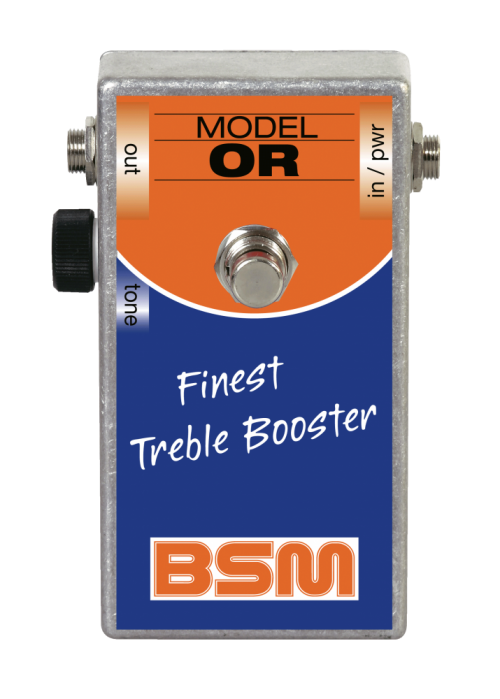 The BSM OR model is based on the Orange Treble & Bass booster made in the late 60's in England. The OR model includes a tone control which allows an extraoridinary amount of versatility. When set to maximum, the unit produces a very glassy tone. When a middle setting is dialed in, the result is a punchy tone with a mids emphasis. When set to minimum, the unit produces a very bassy tone with a fat bottom end. The long yearned new edition, now issued under the name OR from BSM, includes the same germanium transistors as the original 1960's version. The Treble and Bass Booster is inserted between guitar and amplifier, not into the FX loop. The magical tone is achieved by the interaction between guitar pickup, booster and amplifier. The unit is powered by a 9V battery with a current consumption of approx. 400 uA. The average output level is 9dBm, the maximum output voltage when the strings are struck really hard is 7V max. Note: The positive pole of the battery is ground. If you have any questions concerning our products, especially the BSM OR Treble/Bass Booster, our tech-head and mastermind Mr. Bernd C. Meiser would be happy to talk to you. So don't hestitate any longer and send him an email to info@treblebooster.net or use the contact form to contact him.